With the next campaign already on the horizon, Republicans view their online donor deficit — particularly acute in House races, but significant in Senate contests, too — as a primary obstacle. Josh Holmes, a top McConnell political adviser, has begun making calls to senior Republicans and a group of party figures are expected to convene after Thanksgiving. An ActBlue counterweight, he said, would require buy-in across the splintered Republican Party apparatus. Republicans have long acknowledged the shortcoming and spoken out about the need to fix it, to no avail. But this year’s gaping money disparity between the two parties has snapped the GOP to attention. The concern comes after a 2018 campaign in which the party was out-raised by historic proportions. During the third quarter alone, 92 House GOP incumbents collected less money than their Democratic challengers, and 51 of those Republicans raised less than half of their rivals. The cash shortfall imperiled Republicans across the map. 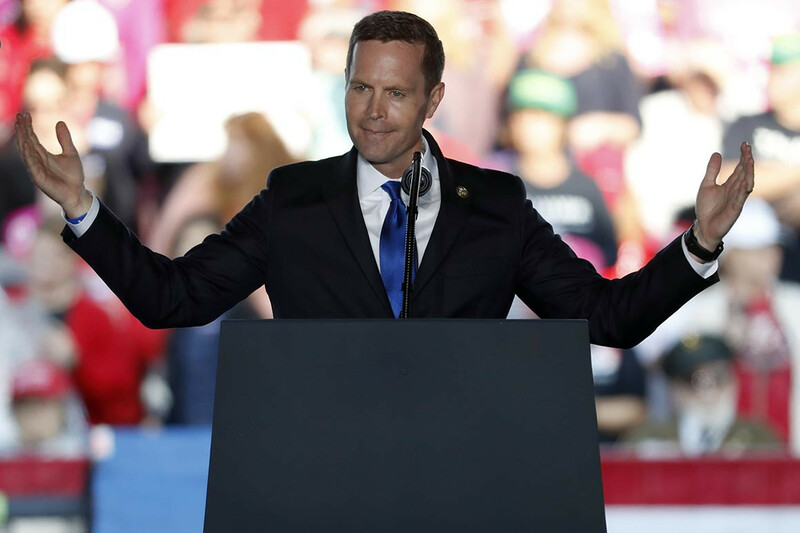 In Illinois, GOP Rep. Rodney Davis, who was once thought to be safe, was outpaced by more than two-to-one between July and September, wiping out his early money advantage. Davis managed to hang on, but only barely. Republican Senate candidates, meanwhile, were out-raised in nearly every key race — and in some states, such as Montana and Nevada, the deficits were glaring. The thirst for an ActBlue-like platform has become a central point of discussion as Republicans plot out a roadmap to win back the House majority and select their new leadership. During a House Republican conference call on Thursday, Arkansas Rep. French Hill complained that the party didn’t raise enough small donations and should have its own version of ActBlue. Hill, who fended off a stiff challenge despite being out-raised in the third quarter, said he would only support a candidate to lead the House GOP campaign arm who was committed to creating such a platform. Rep. Mimi Walters (R-Calif.), who is locked in a close race for reelection that has yet to be called, said she’d had conversations with an array of House lawmakers since last week’s elections and found widespread agreement that the party needed to address its online donor problem. “They’re very concerned about being able to compete with ActBlue and it has to be a top priority,” she said. Among the lessons Republicans say they learned this year is that the party can no longer just rely on a few billionaire mega-donors like Las Vegas casino mogul Sheldon Adelson. He and his wife, Miriam, contributed over $100 million to GOP-aligned super PACs over the course of the campaign. While the 85-year-old Adelson remains a crucial source of funding, Republicans concede their advantage in billionaire giving has narrowed considerably. Former New York City Mayor Michael Bloomberg and San Francisco hedge fund manager Tom Steyer each plowed over $100 million into campaigns for Democrats, investments that stretched the 2018 map and put Republicans on defense in races once thought to be beyond reach for the opposing party. Just as importantly, Republicans say they’ve come to fully recognize the limitations of billionaire-funded outside groups. Because super PACs must pay a higher rate to air TV commercials than individual candidates, those candidate-raised dollars go farther. The lack of a singular Republican online donation platform partly reflects the fractious nature of the GOP ecosystem — a world filled with competing forces who jockey for attention, contracts, and dollars. Republicans have several online fundraising platforms, including Revv, Victory Passport, and Anedot. Yet the party has not consolidated around any of them the way Democrats have with ActBlue, which boasts that it has raised over $3 billion since its 2004 founding. Holmes said he was not interested in creating a new platform, but rather in getting Republicans to work together in a way that replicated the centralized nature of ActBlue. Yet other Republicans say the problem goes deeper. Zac Moffatt, who was digital director on Mitt Romney’s 2012 presidential campaign, said Democrats had succeeded in devising a playbook that guaranteed a constant stream of online donations. The party, he said, had invested heavily to develop data files on supporters, who they kept in touch with throughout the campaign.